EXECUTED BY LETHAL INJECTION 12-09-99 01:37 A.M.
Summary: Fleenor went to an evening church service attended by his estranged wife, Sandra Sedam, and her parents, Bill and Nyla Harlow. He stayed briefly, then left. When Sandra and her parents returned to their home, Fleenor appeared in the hallway and immediately shot Bill with a .22 he purchased earlier in the day. Fleenor ordered Sandra, her mother, and 3 grandchildren to sit on the couch. He allowed Nyla to go to her husband. As Nyla assisted Bill on the floor, Fleenor shot her in the head. He ordered Sandra and the kids to carry her body to the bedroom. He forced Sandra to drive to her brother's home to tell him they would be out of town for a few days, then returned to the Harlow home. Bill was still alive and asked about his wife. Fleenor said, "I can't let him suffer" and shot him dead. The next morning, Fleenor fled to Tennessee with Sandra and the children in tow. Trial:	Information for Murder filed/PC Hearing (12-20-82); Change of Venue Ordered (03-17-83); Voir Dire (11-07-83; 11-09-83, 11-10-83, 11-14-83; 11-15-83, 11-16-83,); Jury Trial (11-17-83; 11-21-83, 11-23-83, 11-28-83; 11-29-83, 11-30-83 12-01-83); Deliberations 3 hours, 55 minutes; Verdict (12-01-83); DP Trial (12-05-83, 12-06-83); Deliberations 8 hours, 5 minutes; Verdict (12-06-83); Court Sentencing (01-04-84). Debruler Opinion; Shepard, Givan, Pivarnik, Dickson concur. Fleenor v. Indiana, 109 S. Ct. 189 (1988) (Cert. denied). PCR Petition filed 01-30-89. PCR denied by special Judge Mark Lloyd on 02-12-91. Affirmed 5-0; DeBruler Opinion; Shepard, Givan, Dickson, Krahulik concur. Petition for Writ of Habeas Corpus filed 08-22-94 in U.S. District Court, Southern District of Indiana. Petition for Habeas Writ denied by Judge David Hamilton on 02-02-98. 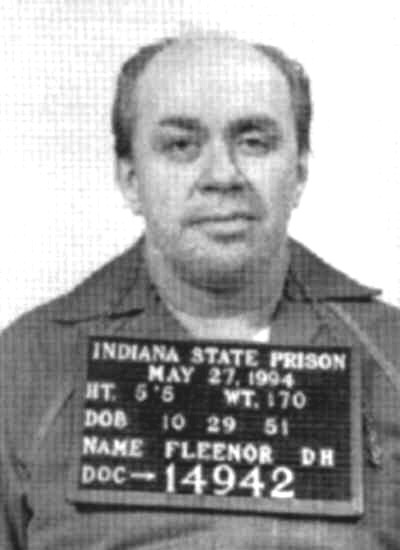 FLEENOR WAS EXECUTED BY LETHAL INJECTION 12-09-99 1:37 AM EST. HE WAS THE 77th CONVICTED MURDERER EXECUTED IN INDIANA SINCE 1900 AND 7TH SINCE 1977.